"In the same boat": Cooperation in Arctic "should be depoliticized"
Arctic-related issues should only be resolved through depoliticized cooperation between all countries in the region, Russia's ambassador to Washington told Sputnik on the sidelines of the Conference on Global Leadership in Anchorage, Alaska. 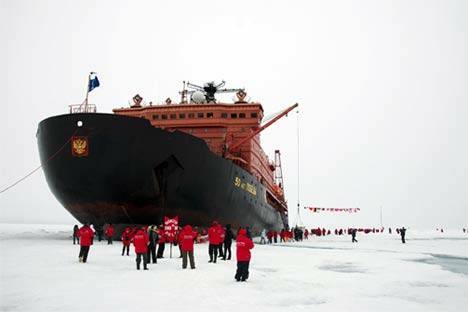 The ambassador said that Russia was implementing a lot of projects in the Arctic to protect the environment and introduce new technologies to monitor the situation in the region, but Moscow would like to see the other countries in the region making similar efforts. "Of course the Arctic issues demand great strategic insight and cooperation between all the countries. Depoliticized, focused on specific cases [cooperation]," Sergey Kislyak said. "The Arctic is the area where we all are in the same boat. Any negative changes in the Arctic would have the same negative impact on [Russia] as on Alaska, Canada or Norway," the ambassador warned. The Arctic Council is the only international platform capable of promoting the development of cooperation between the countries in the region, Kislyak said on the sidelines of the Conference on Global Leadership in the Arctic (GLACIER). Is the potential of the Arctic worth the expenses? "The GLACIER conference did not involve specific programs, activities, initiatives, because it is the prerogative of the Arctic Council. And it is our consistent position that the serious issues of cooperation should be addressed there," the ambassador said. He added that the conference, however, was useful because it provided "an opportunity to exchange views, to listen to experts who are closely monitoring the ecological situation in the region, it provided an opportunity to emphasize the need for states to cooperate more in order to prevent scenarios where the environmental situation develops negatively." Some 20 countries and hundreds of policy makers, diplomats and scientists took part in the GLACIER conference, held on August 30-31. The participants discussed climate change, adaptation planning, strengthening cooperation in Arctic affairs, and other pressing issues facing the Arctic today. The Arctic Council is an intergovernmental forum where problems faced by the governments of Arctic countries can be aired. Eight countries are members of the Arctic Council, including Russia, while 12 countries have observer status. The Conference on Global Leadership (GLACIER) in the Arctic, which brings together countries in the region, attempts to form bridges for cooperation instead of getting bogged down in the differences that exist between Arctic nations, Kislyak told Sputnik. "The general political backdrop to this forum was quite interesting. I personally liked the participants' focus on what we can do together, not on the problems that separate us form each other."